The United States generates over 250 million tons of waste each year. Of that waste, about 33 million tons is plastics, and only about 6.5% of those plastics are recycled with another 7.7% burned to produce electricity. Worldwide, of the over 100 million tons of plastics that are disposed of, about 7 million tons end up in the world's oceans leading to patches of garbage in the ocean such as the Pacific garbage patch, which at a minimum is the size of Texas. The Pacific Garbage patch is an icon, a well known representation of the toll that plastics are taking on both marine and land environments. Plastics that were originally designed to last for decades, are doing just that. Except, instead of lasting in our homes or businesses, they are lasting for centuries in our landfills, in oceans, and in other places where they were never designed to be for so long. The environmental impacts of plastics are significant at almost every stage of their lives from cradle to grave. Manufacture — many plastics are made of synthetic polymers, which use immense amounts of oil and other petroleum products during manufacture. Manufacture of plastics to meet worldwide demand also makes up a significant portion (over 10%) of toxic air emissions in the United States every year. During manufacture, plastics production involves the release of such hazardous chemicals as trichloroethane, styrene, toluene, and benzene and environmentally detrimental gases such as sulfur dioxides, nitrous oxides, and methanol. Use — while most plastics are not inherently dangerous to human beings, a few are. For example, styrene used to make polystyrene and styrofoam products is a potential carcinogen and high exposure to styrene can cause neurological impairment. In other plastics it is the additives that create potential risk to human health. For example, while originally thought to be safe, BPA is now a suspected endocrine disruptor and is a common additive in polycarbonate products such as plastic water bottles. Phthalates can also disrupt the body's hormones by acting as a weak estrogen, causing abnormal hormone levels in infants and children as well as asthma and other allergies. Phthalates are commonly used as plasticizers to make rigid plastics, such as PVC, more flexible. Disposal — the best case for plastics in minimizing impact both on human health and on environmental health is to use and consume fewer in every walk of life. However, for the plastics that do reach the end of their useful life while in our possession, the best choice is to ensure that all plastics stay in a controlled and regulated waste stream. This can be done by disposing of what cannot be recycled, reused, or repurposed into a legitimate landfill. Plastics that do not remain in the waste stream, exit into the open environment, both on land and in oceans. This creates havoc for decades and centuries to come, not only for plants and animals but for people as well. Degradation — unlike many other pieces of trash, plastics do not biodegrade over time, but they do photodegrade, breaking down into smaller and smaller pieces over time when exposed to light. Littering or illegally dumping plastic is the worst possible way to get rid of plastic waste. Doing so allows plastic to degrade into microscopic particles that can ultimately migrate all over the world. Attempting to degrade or eliminate plastics by burning them is rife with toxic releases that make backyard burning of plastics one of the most hazardous activities in residential life. Among other emissions, burning plastic at relatively low temperatures that are associated with backyard burning releases dioxins and furans, the most toxic substances and most potent carcinogens on the planet. 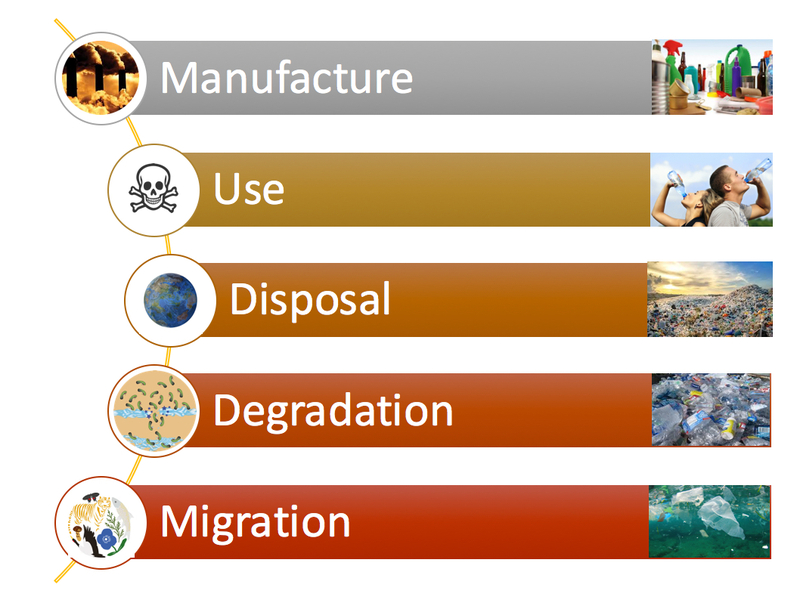 Migration - as plastics break down into smaller and smaller pieces outside the formal and regulated waste stream, they can literally migrate anywhere in the world. In some cases, plastics migrate close to their original form, where they are ingested by wildlife such as shore birds or entangled with larger animals like sea turtles. Plastics can also serve as rafts in the ocean, hauling off biota and flora to far away places where they are no longer indigenous to the area, causing major and often unanticipated harm to biodiversity and ecosystem balance. Ironically, plastics were originally formulated to give consumers long lasting, more permanent products to reduce waste, cost, and environmental harm. Instead, however, plastics have evolved into some of the most disposable products on the planet, while increasing the volume and longevity of waste manyfold over other waste products. How do Plastics harm the Environment? North, E. J., & Halden, R. U. (2013). Plastics and environmental health: the road ahead. Reviews on Environmental Health, 28(1), 1–8. Thompson, R. C., Moore, C. J., Vom Saal, F. S., & Swan, S. H. (2009). Plastics, the environment and human health: current consensus and future trends. Philosophical Transactions of the Royal Society of London B: Biological Sciences, 364(1526), 2153–2166. Verma, R., Vinoda, K. S., Papireddy, M., & Gowda, A. N. S. (2016). Toxic Pollutants from Plastic Waste - A Review. Procedia Environmental Sciences, 35, 701–708.